The advantage of a U-boat is the ability to work with the ﬁsh without leaning out over the inﬂated tube. The open end provides much easier access. 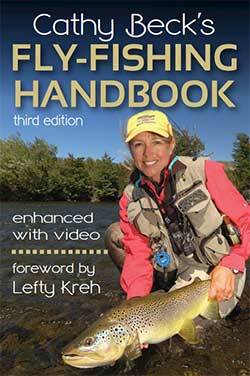 A big part of the appeal of ﬁshing is that we can ﬁsh in all kinds of water. In fresh water, we have ponds, lakes, reservoirs, streams, and rivers. Salt water offers ﬂats, channels, lagoons, estuaries, and bays. In order to effectively ﬁsh in all of these situations, we will need different modes of water transportation. There are many choices to consider, depending on our speciﬁc needs and requirements. Regardless of what mode we choose to help us get around on the water, safety should always be foremost in our minds. By taking a boating safety class, we will not only learn how to safely operate a boat but also better understand currents and ﬂows, how to handle emergencies, and how to prevent a bad situation from becoming a disaster. If you’re near salt water, you’ll learn about incoming and outgoing tides, wind, and weather; you may learn to read a navigational map, and maybe some ﬁrst aid. A class of this type will help you become more adept around any type of watercraft—and you never know, the life you save may be your own. Safety should never be taken lightly. Going out a few times with someone who is experienced with the type of watercraft you’re using can be a big help. This person can save you from making a lot of mistakes, some of which can be costly. Safety aside, the shortcuts alone that you can learn from someone more experienced are valuable. I know—I tried to teach myself to paddle a canoe and didn’t know for months that I was facing the wrong direction and had the wrong paddles. I repeated the mistake when I tried to ﬁgure out a ﬂoat tube—I kept tripping over my ﬁns because I couldn’t see my feet and the tube was in the way. Until just a few years ago, our choices in watercraft were pretty limited. We could consider a boat, a canoe, a raft, and more recently a ﬂoat tube. We now have all kinds of inﬂatables available. You’ll ﬁnd the right craft for you, depending on the kind of water you’re going to be on most of the time, the type of vehicle you drive (in order to transport the water- craft), and your budget. For a while, you’ll be happy walking the edges of your favorite stream, ﬂat, or pond to get to the ﬁsh. But before long you’ll start thinking that the really big ﬁsh are too far out to reach, or that if you could just get to the other side, the ﬁshing would be better. If you’re on a saltwater ﬂat, you may have tides to deal with. If the tide is coming in, you may not be able to get back, or there may be narrow, deep channels that you can’t cross, and again, the ﬁsh are always on the other side. Well, now you can get there—and back. 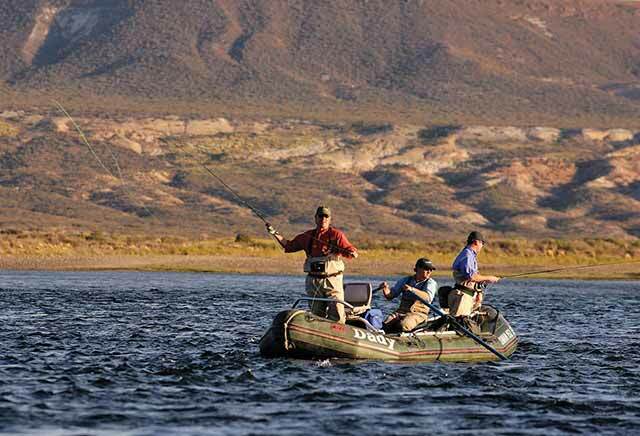 Henry Clement and Hank Ingram with guide, Leo Madeja, on the Lemay River, Argentina. 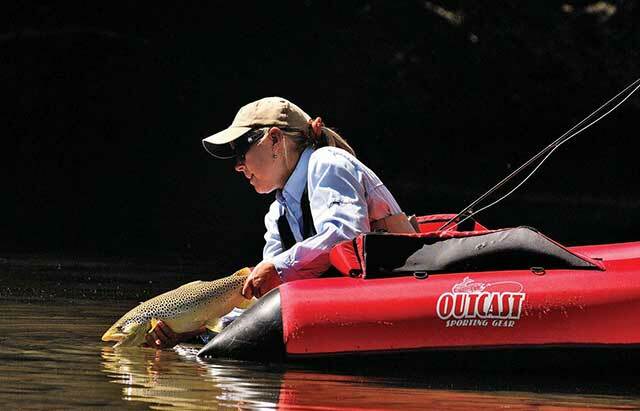 One or two-person inﬂatables have a lot of advantages for ﬁshermen. They are easy to transport, and when deﬂated, take up little room in the car. They quickly inﬂate with a battery or foot pump and are lightweight and easy to carry to the water. They can be powered with a set of ﬁns, an elec- tric motor, or oars or paddles. Inﬂatables are available in lots of different models and prices. Float tubes have come a long way since ﬁrst being introduced many years ago. Today they are safer, better constructed, and have more fea- tures. The tube is actually two or three separate bladders that are inﬂated individually. They usually have at least one bladder for the back rest, which is also inﬂated separately. The rubber bladders are covered with a heavy-gauge-denier nylon that resists tears and punctures. In the event that one bladder should be punctured, the other inﬂated bladders will be enough to get you to shore. Depending on the model, it may have zippered external pockets for ﬂy boxes, lunch, and other accessories. There may be Velcro rod holders to fasten the rod to the tube for changing ﬂies, changing location, or working on the leader, an O-ring for a net, a nylon apron to help control the line, and even an anchor to help you hold a position. Stocking-foot waders are usually best when using a ﬂoat tube because the waders are stretchy, warm, and comfortable. Instead of wading shoes, often a pair of neoprene socks or booties with a set of ﬁns will work well. The neoprene socks or booties will protect the feet on our waders when we’re getting in and out of the water. Most ﬁns today ﬂoat to the surface if they work loose from your feet. Otherwise, they should be tied with cord or shoelaces around the ankles so they don’t go to the bottom if they come off. Because the ﬂoat tube is shaped like a doughnut, it can be tricky to get your feet through the leg openings when wearing the ﬁns. But getting the ﬁns on with the tube around your middle is even more difﬁcult. The only person I’ve ever seen fall out of a tube was trying to get in it! Go slow and take your time. Once you’re in, and near the water, it’s easy to walk back- ward to the water. It’s hard to go forward wearing the ﬁns and when you look down, you can’t see your feet because the tube is in the way. Slowly back in to just above your knees and sit down in the seat. You’ll be aﬂoat and if you paddle with your ﬁns, you can move along easily. Remember, you’ll be going backward, so you have to keep an eye behind you to stay on course. The U-boat came along a few years after the ﬂoat tube. As the name indicates, a U-boat is shaped like a horseshoe, with an open end. The seat is similar to a ﬂoat tube, but it’s much easier to get in and out of. Once the ﬁns are on, you can back out into a couple feet of water and, with the U- boat behind you, take hold of the two ends and pull them forward around you. Sit down and you’re in. Most models have quick-release seat belts to hold you in place, and a mesh apron that attaches in front, providing a work area. The ﬂy line can also lie in coils on the apron when it’s not being used. The U-boat and similar designs offer the same features as the ﬂoat tube. U-boats tend to be a little heavier and more awkward to carry, but they are easier to ﬁsh from once in the water. Having the open front makes landing ﬁsh easier. Reaching over the tube is sometimes difﬁcult. Fishing from the ﬂoat tube or U-boat is a unique experience. Because you are low in the water, the ducks and turtles didn’t scurry away in fright. And the birds alongside the stream continued chirping and singing. We don’t announce our presence in a tube like we do when we’re upright and walking. Much larger than a ﬂoat tube or a U-boat, pontoon boats and rafts offer rowing platforms that are attached to two inﬂated or durable hard plastic pontoons. The area between the pontoons is open to the water so you can sit on a seat with your legs down in the water or you can rest your legs on the frame. Pontoon boats are easy to get into and can be picked up easily and carried over shallow rifﬂes. Most pontoon boats feature a lightweight aluminum rowing platform or have oarlocks on the pontoons. The oars are a great asset on windy days or in water with current. Along with the oars in single-user pontoon boats, the user wears ﬁns to ﬁne-tune positioning. If you want to stop in shallow water, you simply stand up between the pontoons and the boat stays with you because you’re standing inside the frame. You can make easy turns with the ﬁns whenever you need to change position. An ice cooler attached to the rowing platform behind the seat makes a great place to store lunch or extra gear. A raft offers lots of options too. Some rafts are small and the passen- gers sit on the edge rowing as they go downriver. This is an easy way to get from one section of river to another, but is not very comfortable and it’s hard to keep gear dry. Larger rafts have a frame, a wood ﬂoor to cast from, and comfortable seats. Dry bags and coolers can be strapped to the frame for safety in case you encounter some rough water or rapids. Rafts come in all sizes and designs for different situations and needs. Regardless of design, these one-person inﬂatables should always be limited to still or slow-moving water. Most versions are not designed for fast water, and although most models have at least two inﬂatable bladders, you should always wear some type of personal ﬂoatation device (PFD). Some state laws require that you do. Make sure you know the regulations where you are ﬁshing. Inﬂatables are all vulnerable to wind, so use common sense on windy days. It may be easy going out across the lake, but you have to come back too. If there are waves and whitecaps on the water, look for a protected cove and avoid the wide-open water. If the wind is bad, wait for a better day. If you’re ﬁshing large reservoirs or areas where boat motors are allowed, wear bright clothing and be alert for boats. You’re going to be hard to see, and the boats may be going fast. Stay fairly close to shore and leave the deep water for the motorboats. Look for areas that allow only electric motors; they are quiet and slow—and safe. Don’t stay out after dusk. Not only will you be impossible to see, but the shore can look all the same and you may not be able to ﬁnd the take-out spot. Tell someone what your plans are and take your cell phone if there is cell coverage. Put a waterproof ﬂashlight in one of your pockets and make a note of land- marks on the shore that you’ll be able to recognize at dusk. Cathy ﬁshes from a kayak on Fishing Creek, PA.
Perhaps the most popular of all modes of water transport is the kayak. Kayaks are lightweight, easy to maneuver, fairly stable, and easy to ﬁsh from. Some are designed for still water and others for moving water. They come in all lengths and prices, so there is a kayak to suit just about any need and budget. That said, kayaks too require a little practice and getting used to. Don’t take safety for granted. It’s very easy to get into trouble with a kayak, just like anything else. But with some experience and common sense, a kayak is a great way to get to the ﬁsh. The canoe is one of my favorites. Although I’m not an expert at handling a canoe, and I’m still hesitant to take along anything that shouldn’t get dunked, I still love to be in one. It’s quiet and easy to maneuver on calm water and can go in shallow places. We have a fairly wide canoe, which is a little more stable than some. And we’ve learned some lessons the hard way. For instance, it’s easier when there are two people, one to paddle and the other to ﬁsh. And keep all the loose items in a bag fastened to a seat. As a matter of fact, tie every- thing down, including the cooler. Know where the PFDs are and the boat cushions. Always have a change of clothes in the car or dry bag. It’s amaz- ing how fast a canoe can tip! Our canoe is ﬁberglass. I can lift it and carry it a short distance, but I can’t get it on and off the roof rack by myself. Aluminum canoes are lighter and easier for one person to handle. Weight is a major consideration for the person ﬁshing alone. As quiet as a canoe is, and as much as I like them, most of the time I am in a boat. There is always lots of room, so you can move around easily and be comfortable. Some boats have padded seats, or you may sit on boat cushions. There may be storage compartments for extra gear and maybe even a casting platform for the ﬁsherman. You can be fairly certain that the tackle and binoculars will stay safe and dry. The bow may be carpeted and there may be rod holders. A small rowboat on a bass pond may be simply equipped with a set of oars. On the other hand, the boat you take to the local lake may have oars and an electric motor. Electric motors are good for a few hours, and then they need to be recharged. An extra battery can be taken along for additional time. These motors are quiet and easy to operate, but they don’t have a lot of power. They should never be used in situations where thrust and speed are needed. A boat on a big river or lake will probably have an outboard motor. Outboards run on gas, and an extra tank of gas can easily be taken along. A lot of things can go wrong with outboard motors, and someone in the boat should have some experience in running boats and troubleshooting motors. A skiff is often used on saltwater ﬂats because it can navigate shallow water. Many skiffs have two seats for anglers and one for the guide. There is usually a casting deck for the angler and sometimes a poling platform for the guide to stand on to pole the boat quietly across the shallow ﬂats looking for ﬁsh. On some larger rivers, skiffs are popular, but on Western rivers a drift boat is a common sight. Drift boats don’t have motors; the guide uses oars to quietly cover a section of river. His clients will be comfortably seated one in front and one in back of him. The sides of a drift boat are usually higher than a skiff. Anglers can cast from the boat or the guide may pull over to the side so his anglers can get out to ﬁsh runs, pools, and rifﬂes. I’m fortunate to have been around boats all of my life. We had boats at home and went to Canada every summer for many years. When my sister and I were little, my parents would pack up tents, cooking utensils, food, ropes for tree swings, swimming things, and all of his ﬁshing gear (including his boat), and off to Canada we’d go. Looking back, as little girls these vacations gave us wonderful memories of days spent swimming and playing around the camp. Mom would read, sit in the sun, settle disputes, and do the cooking. We all had a great time until the end of the trip. On the last day Dad would put all of us (my mother, my sister, and myself) in the boat for a ceremonial last day boat ride—and he would try to ﬁsh. All week, up to this point we were happy, but this last day was always something else. 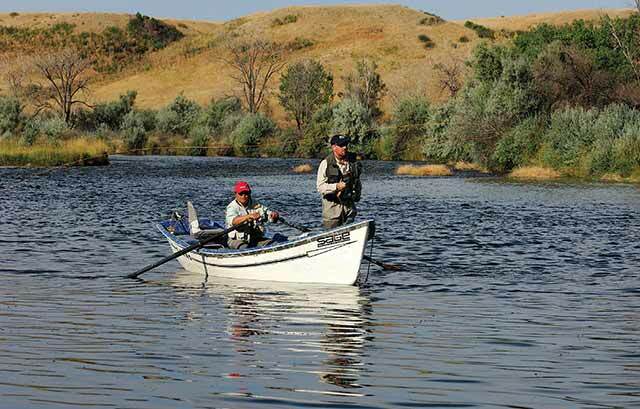 Ron Taniwaki and Joe Codd ﬁsh from a drift boat on the Bighorn River, MT. Of course, once in the boat we couldn’t sit still and every time we moved we would kick the tackle box, drop or knock something off the seat and make a noise, get into a squabble with each other, or have to go to the bathroom. Dad would ﬁrmly tell us, in his not-so-patient fatherly voice, to sit down and be still. Mom would sit in the back of the boat and read a book, trying not to get involved. Needless to say, no one enjoyed that last day. In hind sight, he should have gone ﬁshing on his last day and we should have stayed in camp. Everyone would have been happy. All boats, especially aluminum boats, transmit sound. Fishermen have to be careful not to move coolers, kick soda cans, or drop ﬂy boxes in the boat. Even a rod sliding off the seat and the reel hitting the boat bottom can scare the ﬁsh. Wear rubber-soled shoes and keep loose items stored so they don’t make noise. Before you take off in a boat, know where the PFDs and boat cushions are. Put a strong waterproof ﬂashlight in the gear bag and have another one in camp. Make sure someone in camp knows that you’re going out and when you expect to be back. If you’re late and they’re watching for you, signal with your ﬂashlight and have them signal back to give you an exact location on the camp. In the event that you have engine trouble, the ﬂashlight can announce your location when help comes looking for you. When you put the boat in the water before taking off, take a good look around and locate a couple of landmarks that you can see from a distance. If you’re on a big lake, it’s easy to get turned around and lose your bear- ings. Nowadays you can easily mark the location on your GPS, and in many places you can call camp or home on your cell phone. But, make sure you have reception. 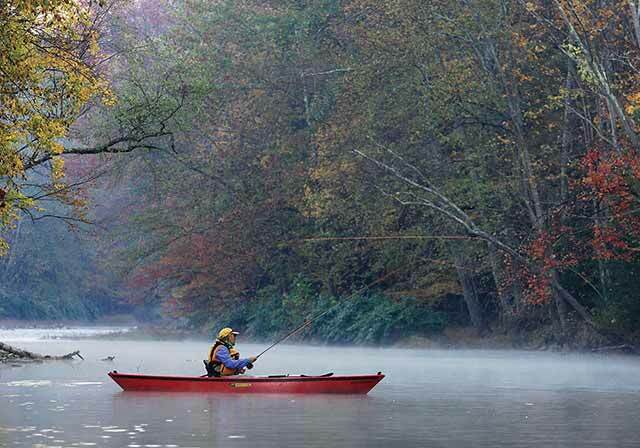 A ﬂoat tube, pontoon boat, skiff, raft, kayak, canoe, and boat are all great ways to enjoy ﬁshing. Keep an eye on the weather: Watch for storms and wind, and head back if it looks like bad weather is coming your way. If you’re inexperienced, stay close to shore for a while and go a little farther out each time. As with everything, stay alert to what is going on around you and use common sense. Any type of watercraft can provide many hours of fun and pleasant memories.